The following lodging businesses support the Jackrabbit Trail. Please consider them when booking lodging in the area. Thank you! Complete x-c ski center. Bunk rates include breakfast. Special group rates available.. Guide service. The "hub" of the Jackrabbit Trail. Skating and X-C skiing from our door. Private balconies. 100% non-smoking. Center of village, health club, fireplaces, night club, ski packages. Lake Placid’s only environmentally-friendly resort. See ad on Services page. 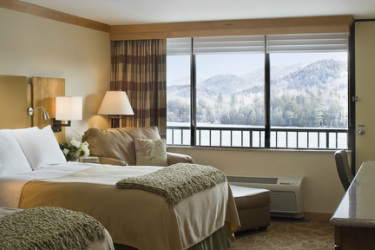 Overlooking the shores of Mirror Lake and and anchoring Main St. - the hub of shopping, dining, and entertainment - is High Peaks Resort, a modern Adirondack retreat in the heart of Lake Placid. See ad on Services page. Since 1961, Lake House has been part of the Lake Placid community, with its rich Olympic history and beautiful natural surroundings. After extensive renovation, this jewel of Lake Placid hotels, located on the shores of Mirror Lake and at the foot of Main St., is now a welcome retreat for today's active traveler. We invite you to share our home - as well as our trails, lakes, and slopes - whether this is your first trip to Lake Placid or an annual tradition. Available services: Adjacent restaurant, indoor pool, Pets with restrictions. Merrill L. Thomas Real Estate, Inc. Cozy cabins, cottages, private homes and camps in the Lake Placid area featuring full kitchens. 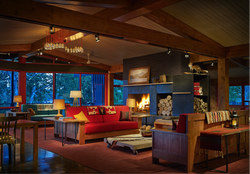 Many with fireplaces and hot tubs. See ad on Services page. We have a great location! Minutes to Main St. and Mirror Lake. On the way to x-c skiing and the High Peaks. restrictions, see website for details. Free pass with lodging for 50 km Oympic trails that cross property. Family run, spectacular views, full breakfast w/room. Friendly hospitality. Ski out back door. Sauna. Available Services: breakfast, see website for details. Clean, homey atmosphere. 22 bunks, two private rooms, comfortable mattresses, community kitchen. 27 years combined Adirondack experience. Large groups and individuals welcome. Available Services: nearby restaurant, see website for details. # 1 Resort and #1 Ski Hotel in the Northeast for the 2nd year in a row. Three restaurants, including The View, Lake Placid's only four diamond restaurant. Ice rink, full spa, complimentary snowshoes, one block from Main Street. Available services: Restaurants, indoor pool, breakfast. In room coffee, fireplaces, outdoor sauna. On Jackrabbit Trail. Cabins or rooms. One mile to center of Lake Placid village. Closest motel to Whiteface Mt. from Lake Placid. 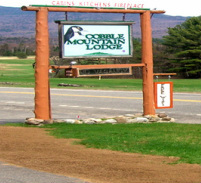 Picturesque inn located directly on Lake Placid, and in the village of Lake Placid. Short walk to downtown or to the Jackrabbit Trail. All accommodations are newly renovated and comfortably appointed with free wi-fi. We offer numerous packages including free x-c skiing on groomed trails. 30 Accommodations – Room rates include a made-to-order breakfast each morning and all activities on property; Cross Country Skiing, Snowshoeing, Tobogganing, Bonfire with s’mores. See ad on Services page. Secluded location near the village of Keene Valley, NY. Open year-round. Close to many High Peaks trailheads. 8 miles to Jackrabbit Trail in Keene, 12 miles to Olympic X-C trails at Mt. Van Hoevenberg. Room rates include breakfast. Two restaurants within walking distance. Also: Three separate cottages $225 - $245 per night. Discounts for longer stays. This convenient bed and breakfast is located "downtown" in the picturesque mountain hamlet of Keene Valley, the heart of the High Peaks. The legendary hiking trails of the Adirondack Great Range begin just minutes from our doorstep, as do a wide selection of other trails for hikers of every level of experience. Keene Valley is also home to many of the celebrated Adirondack rock and ice climbing cliffs. In winter, the extensive trail network provides endless miles of terrain for the snowshoer or back-country skier.